I realized that I have not shared with you all my current skincare routine. Shame on me! We all know that it's very important for us to take care of our skin, in order to keep it looking healthy. 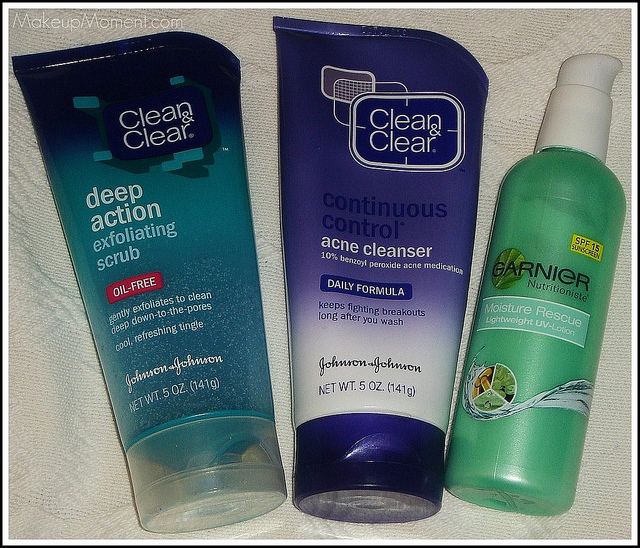 My skin is dry, oily, sensitive, and acne-prone. Here are my top three products that I swear by, and just can't do without because, they have been so good to my skin. The best part? All of these products can be found right at your local drugstore and won't break the bank! 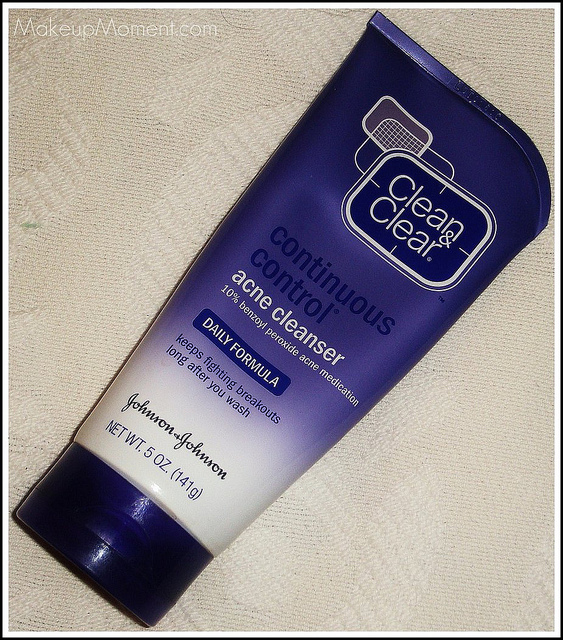 Clean & Clear Continuous Control Acne Cleanser ($5.99)- Ever since my dermatologist requested I use this cleanser for my acne-prone skin a few years ago, I can't thank her enough for turning me on to this product. It really helps control my acne, and I don't break out as much as I used to. What I really love about this cleanser is that it contains 10% Benzoyl Peroxide, which is a great acne fighter. I use this cleanser once or twice a day. I was a little scared that such a high concentration of Benzoyl Peroxide wouldn't react well with my skin because, it's so sensitive. But luckily, my skin can tolerate it and I have been using it with no problems. It doesn't leave my skin feeling dry, or stripped of moisture. This cleanser has the consistency of a thick cream, and I really like the cool, refreshing feeling it leaves, after I rinse it off. 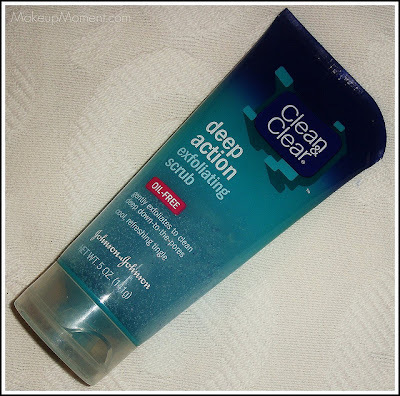 Clean & Clean Deep Action Exfoliating Scrub ($5.99)- I have tried numerous scrubs before, but none have been so effective like this one by Clean & Clear. I have some visible pores on my cheeks, and this exfoliating scrub really does clean all that gunk I have on my face. I use this scrub once or twice a week and I would even go as far to say, that I believe that this scrub has helped my pores decrease in size. This scrub is oil free and the beads feel really nice on my skin. Not abrasive or rough at all. This product also gives my skin a tingly feeling, and my face feels clean and refreshed all day long. Love! 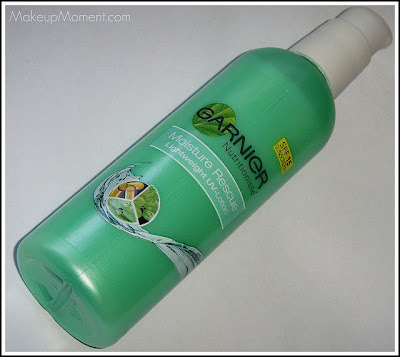 Garnier Moisture Rescue Lightweight UV-Lotion with SPF 15 ($7.99)- I think I have finally found my HG drugstore moisturizer. This moisturizer from Garnier is everything I am looking for when it comes to searching for the right moisturizer (although I wish it contained a higher SPF). I use this moisturizer everyday and it sinks into my skin fairly quick. When I apply my makeup in the morning, my foundation just glides right over it. When it comes to dry spots, I would say that my skin is not as dry as it was before I started using this moisturizer. It has really helped increase the moisture level of my skin. My skin's appearance has greatly improved with the help of this moisturizer which contains Vitamin E (great moisturizer and skin conditioner), Grape water extract (contains antioxidants that helps protect the skin), and Apple water extract (helps the skin stay moisturized). I have not experienced any breakouts or any reaction when it comes to this moisturizer. I really love it and will continue to use it until I find something better out there, that would really exceed my expectations. But who am I kidding? This moisturizer is fantastic, and for just $7.99, it's a win-win situation that is heard to beat. Disclaimer: I am not affiliated with any of the companies mentioned above. I purchased these products for my personal use only.